The first player on this list (as I’m going in chronological order), but actually the last one that I discovered in this round of research, is Sam Clancy. His name was familiar from maintaining the NLSC current roster updates for NBA Live 2003 all those years ago, and I have a vague recollection of consistently placing him on the injured list. It’s actually where he spent the entirety of what should have been his rookie season with the Philadelphia 76ers, who picked him 45th overall in 2002. As it turned out, Clancy wouldn’t ever play in the NBA. The Portland Trail Blazers did sign him in October 2005, but he was ultimately cut, and hasn’t been back on an NBA roster since. That wasn’t the end of his professional career, however. In addition to stints with a couple of minor domestic leagues such as the Continental Basketball Association and the All-American Professional Basketball League – now both defunct – Clancy spent a short time in the D-League. An MVP and Defensive Player of the Year in the CBA, he has since played abroad for most of his career. His stops include Russia, South Korea, Venezuela, France, Spain, and Argentina, where he’s still active. While it’s unlikely that he’ll ever play in the NBA, he hasn’t hung up his sneakers just yet. 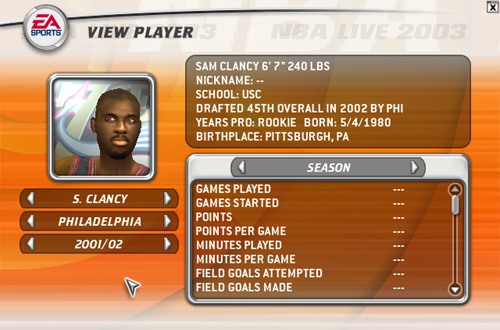 If nothing else, though, Sam Clancy Sr.’s son made it into NBA Live 2003 and 2004. Contrary to the information in the above screenshot, Brad Newley was drafted by the Houston Rockets with the 54th pick of the 2007 Draft. I remember creating him for a roster update and being excited that we’d see another Australian in the NBA, but as of 2018, it’s yet to happen. In fact, after making his professional debut in 2004 with the NBL’s now-defunct Townsville Crocodiles, Newley has spent much of his career playing in Europe. He did return to Australia to play with the Sydney Kings in 2016, though he’s been on loan to AEK Athens since 2017. Like Ben Pepper, it seems he’ll be another Aussie drafted in the second round who never gets a shot in the NBA. Nevertheless, Newley has made it into not one, but two NBA Live titles. This was by way of representing Australia on several occasions as a member of the Boomers, who were among the FIBA teams in NBA Live 09 and NBA Live 10. 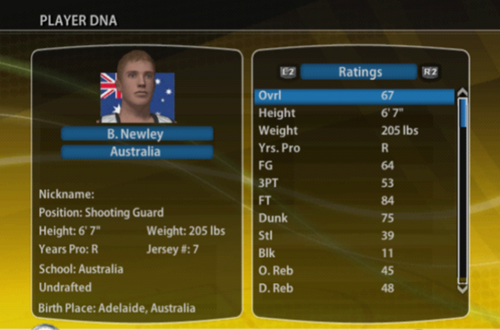 Australia was not among the original eight FIBA teams that were included in NBA Live 08, so Newley didn’t appear in any capacity in the game that was set during what would’ve been his rookie season had he joined the Rockets. He’s a bit different from the other examples, never appearing in a game on an NBA team roster after being drafted, but still being included thanks to his service with the Australian national team. While working on a roster update for NBA 2K11 PC, I noticed a name in the Free Agent Pool that rang a bell: Richard Hendrix. Funnily enough, the only reason I was familiar with him was that I had previously created him while working on the 2009 season roster update for NBA Live 08. At the time, I was still creating every pick in the Draft, which in hindsight contributed heavily to my burnout when it came to the NBA Live roster updates. Beginning the season on the injured list, Hendrix – taken 49th overall by the Warriors – ended up assigned to the D-League. He was released in December, but continued to play in the D-League, where he was named an All-Star. 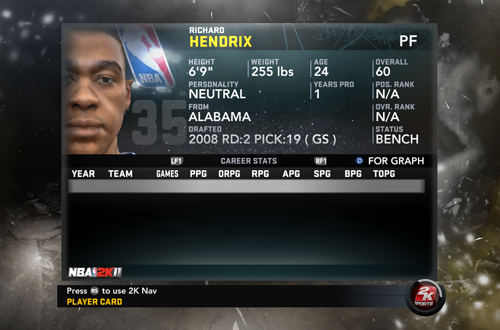 Hendrix was not included in the PS2 version of NBA Live 09, but could be found in the PS3/360 version, and remained in the rosters as a free agent in NBA Live 10. He likewise appears in NBA 2K9 on the Warriors, and in NBA 2K10 and 2K11 as a free agent. He was absent in NBA 2K12, having failed to make an NBA roster after a couple of Summer League appearances. However, with the addition of Euroleague teams, he has since reappeared in NBA 2K15 and 2K16 with Lokomotiv Kuban and Unicaja respectively. Despite never playing in the NBA, his career in Europe – where he still plays today – has helped land him in five seasons’ worth of NBA video games! Another player that I randomly discovered in the Free Agent Pool of NBA 2K11 PC, Matt Janning had stints with the Celtics and Suns in the 2010 Summer League before signing a multiyear deal with the latter. He was released before ever playing a regular season game, but his tenure with the team lasted long enough to land him in 2K11. He spent time in the D-League and in Europe, but didn’t make it back onto an NBA roster until the Nuggets signed him in September 2015. He was once again released before he could make his NBA debut five years after going undrafted out of Northeastern, and for the moment, it seems that he’s content to play professional ball in Europe. Much like the aforementioned Richard Hendrix, Matt Janning’s stint in Europe has offered a route back to the virtual NBA hardwood, thanks to the inclusion of the Euroleague teams in recent games. 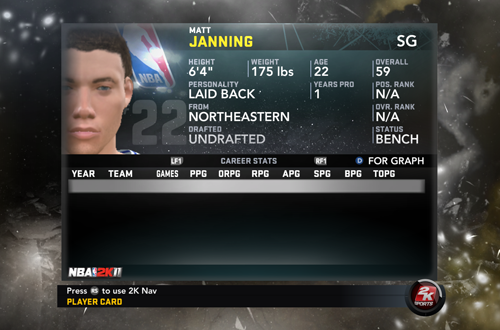 Janning doesn’t have quite as many appearances as Hendrix, only being featured in NBA 2K11 and also in NBA 2K14 as a member of Montepaschi Siena. His brief tenure with the Nuggets in 2015 wasn’t enough to get him into NBA 2K16 as a free agent, but nevertheless, as of 2018 he has appeared in two NBA video games; two more games than he’s ever played in the real National Basketball Association. As the most recent example on the list, I’m guessing quite a few people are familiar with Isaiah Austin. After declaring for the 2014 NBA Draft, Austin’s dreams were derailed just four days before the Draft took place, when he was diagnosed with a genetic disorder called Marfan syndrome. Although his condition forced him to put aside his aspirations of playing professional basketball, Commissioner Adam Silver invited Austin to the Draft where the NBA “selected” him with a ceremonial pick. An emotional moment for Austin, his family, and many fans watching, it was a classy gesture, one of those genuine feel-good moments in sports that we can all enjoy. 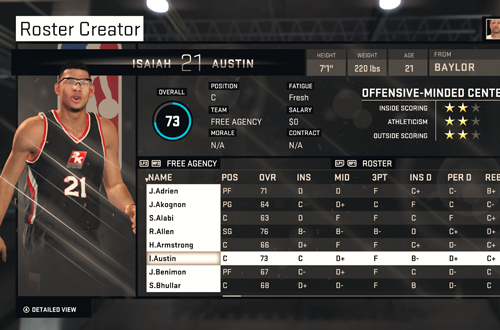 Visual Concepts made a great gesture of their own when they added Isaiah Austin to NBA 2K15 in a roster update, which included a MyTEAM card. Complete with a proper face, a pair of goggles, and ratings befitting a promising prospect, gamers could have Austin play in their MyLEAGUE, MyGM, MyCAREER, and MyTEAM games. In November 2016, Austin was cleared to play basketball again, and has since played professionally overseas. He’s currently with Champville SC of the Lebanese Basketball League, but now that he’s back on the hardwood, it may only be a matter of time before he finally makes his way to the real NBA. Do you remember any of these players? Did you sign them to your team in any of the franchise modes? Can you recall any other examples? Do you expect any of these players to ever get another shot at the NBA? Let me know in the comments section below, and as always, feel free to take the discussion to the NLSC Forum! That’s all for this week, so thanks for checking in, have a great weekend, and please join me again next Friday for another Five.